Automated emails are a marketer’s dream. I remember in the not so distant past being blown away by the concept of pre-scheduling a send, and then being blown away even more by the even better concept of having daily automated sends. Now, there are even more ways to automate emails so they pretty much write themselves. 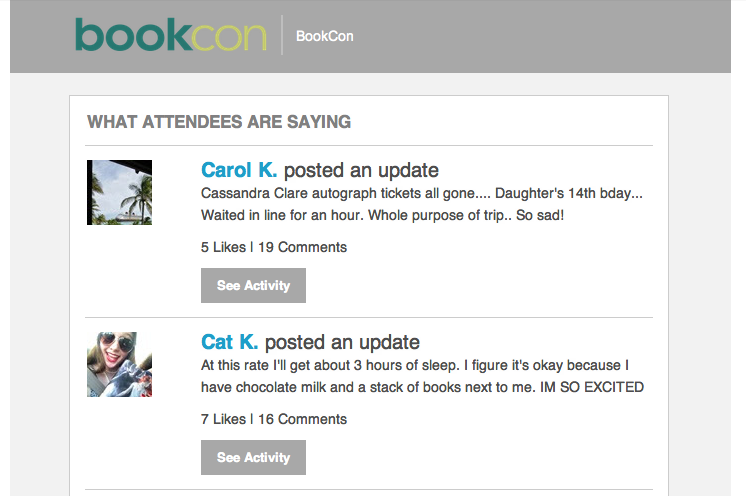 BookCon also sent a few automated emails throughout the day. At other conventions/conferences I’ve been to, that’s a pretty routine thing. Usually there are updates about events and speakers, or perhaps links to recordings from presentations. 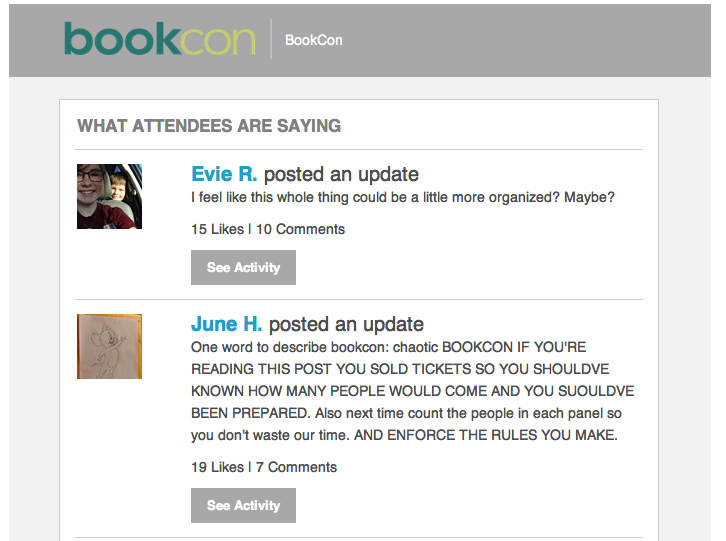 BookCon decided to pull user-generated content from the app. These are the two emails I received during the day, while I was still at the event. I heard there were about 30,000 attendees. Granted, they probably didn’t all opt in to email, and they probably didn’t all download the app. But of all the comments people were leaving about how cool it was to meet their favorite authors, this is what BookCon sent out to attendees. The lesson: If you’re going to send emails with user-generated content, um, read it first. (Sorry for the hacky photoshop job. Just wanted to illustrate that they put me in there twice). Granted, I think I have Google plus accounts through several email addresses, including my work one. So I could see how they might have pulled it in twice. But this isn’t the first email like this I’ve ever received. 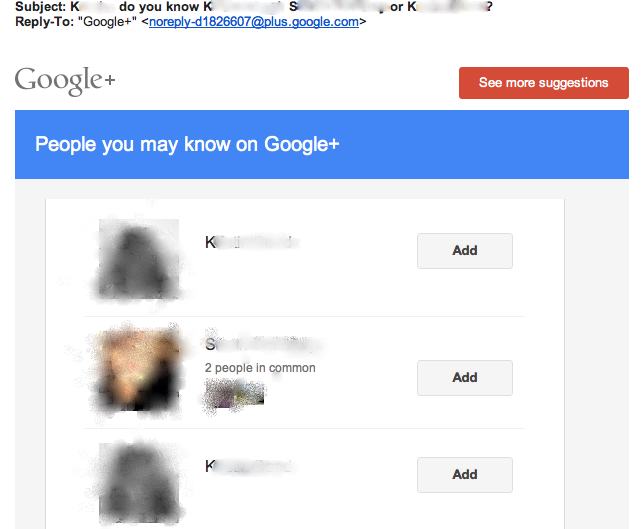 I don’t even use Google Plus, and this isn’t going to make me start. The lesson: Find ways to de-dupe people’s accounts so they don’t get ridiculous emails like this. 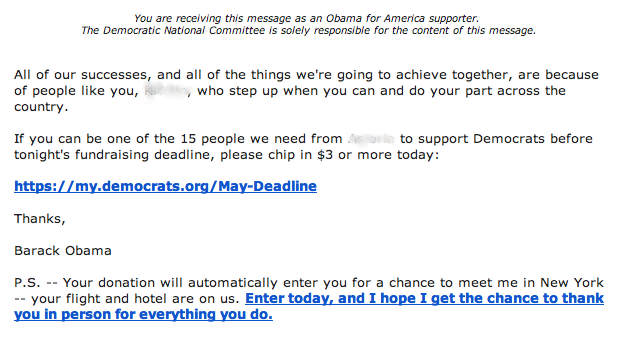 Then today, I got this email from the Barack Obama campaign. I think. Well, it was from the Democratic Party, but the from name said “Barack Obama.” I’m sure we all read the article a while back about all the amazing A/B testing the Obama email team did during the elections. (If you didn’t, go read it. It’s more interesting than this post.) They’re pretty impressive with their subject lines. And today was no exception. Now, it’s not even necessarily a bad email. And $3 really isn’t a lot to ask. It’s the “P.S.” that gets me. They already know I live in New York. A flight and hotel in New York City is not really an incentive for me (I live closer to an NYC airport than Manhattan…). Surely they could have pulled in different content for subscribers who lived in New York (I don’t know, maybe a trip to Washington DC or something?). The lesson: If you’re offering a free trip, make sure it’s relevant to the people you’re offering it to.